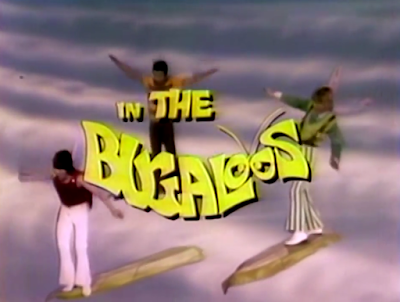 John Kenneth Muir's Reflections on Cult Movies and Classic TV: Saturday Morning Cult-TV Blogging: The Bugaloos: "The Uptown 500"
Saturday Morning Cult-TV Blogging: The Bugaloos: "The Uptown 500"
In “The Uptown 500,” a race is held in Tranquility Forest. The winner of the race will have the opportunity to sing in a TV commercial, so naturally, Benita Bizarre (Martha Raye) wants in. After a car accident between the Bugaloo Buggy and Benita’s car, the nemeses enter the race. But Benita captures Sparky (Billy Barty) and warns the Bugaloos that if they don’t drop out of the race, they’ll never see their friend again. 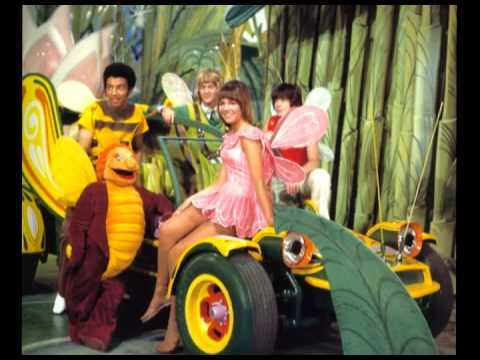 The Bugaloos stay in the race, trying to buy time, while Nutty Bird goes in search of the missing firefly. Fortunately, he is found, and Benita loses the race. You have to admire the ambition of this episode of The Bugaloos (1970). With no budget, and little in terms of studio space, the filmmakers here engineer a dramatic race through Tranquility Forest using nothing but two life-sized car props, a lot of chroma-key work, and some inventive camera angles. This seems like it must have been an impossible episode to produce and pull-off, yet it emerges as one of the more enjoyable of this late-span Bugaloo stories. It is true that we have seen all this before, (Benita and Bugaloos in competition for some singing prize), but the galvanizing principle of the race brings at least some degree of freshness to the proceedings. Once again, however, it must be acknowledged that Sparky is the albatross around the Bugaloos collective neck. He is constantly getting in trouble -- getting captured, or doing something foolish because he feels bad about himself -- and this behavior necessitates constant rescuing. Of course this, and stories like it raise a question. What if Benita Bizarre got what she wanted? What if she got a commercial? Perhaps, if she won, just once, she wouldn't be such a dreadful person.